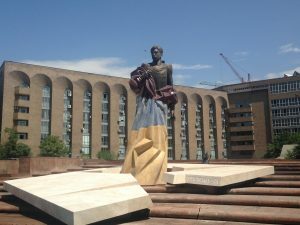 When the first person of the state speaks, it is not only his personal words and they are by no means subjective, they do not depend only on the first person, but also on the social and political atmosphere, on the people themselves. 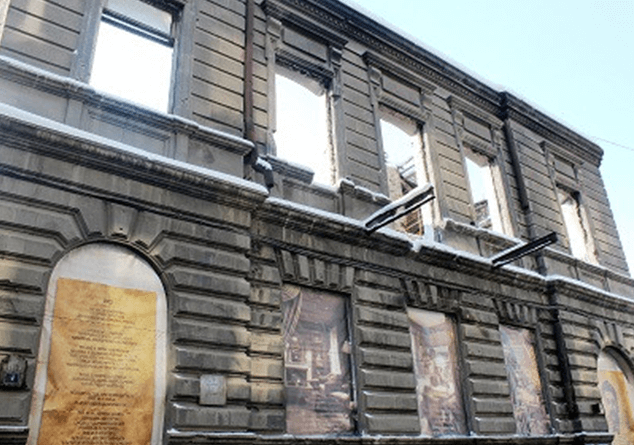 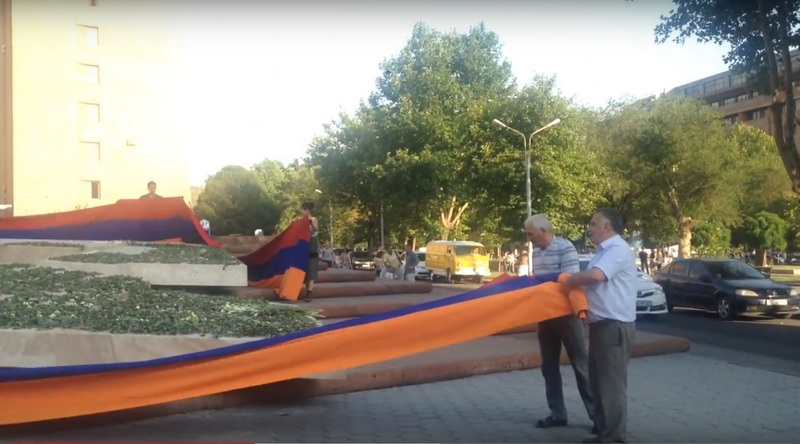 This is how one should perceive the first words of Nikol Pashinyan, told by him in Sardarapat on May 28, 2018 — «proud citizens of the Republic of Armenia». 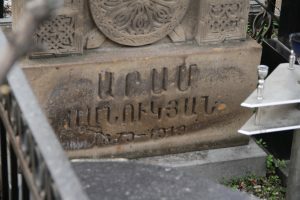 These words in the greeting stood in the first place — before the greetings of the presidents of the two Armenian states. 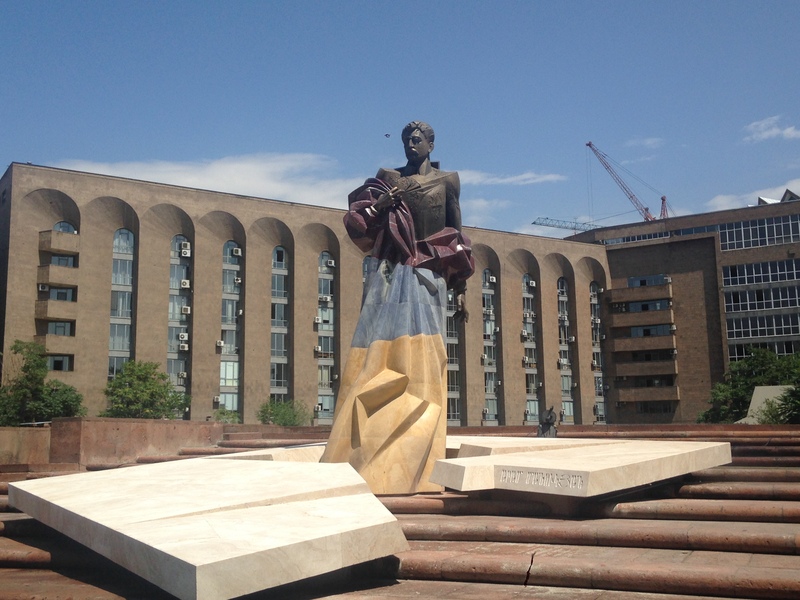 The Prime Minister ended his speech with the words about “the triumphant citizen s” . 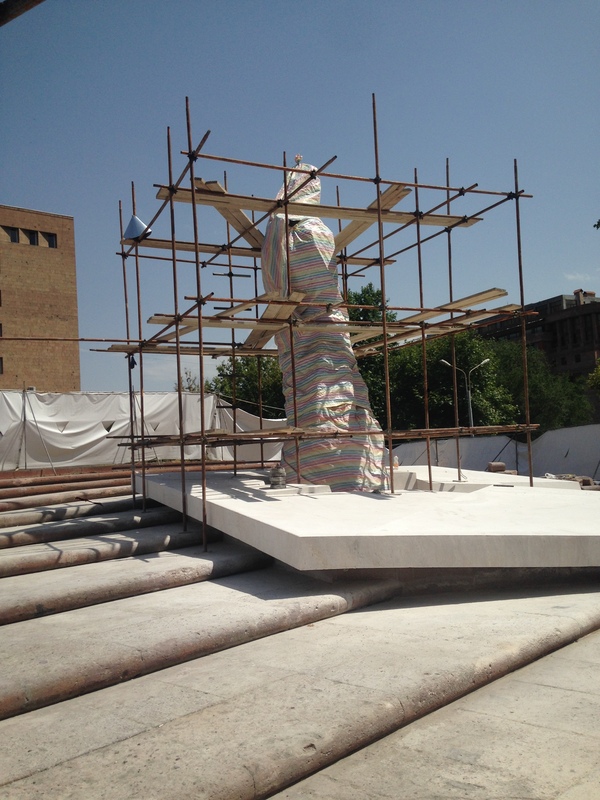 All this is not accidental — it is a symbol of time, a symbol of developing national self-consciousness. 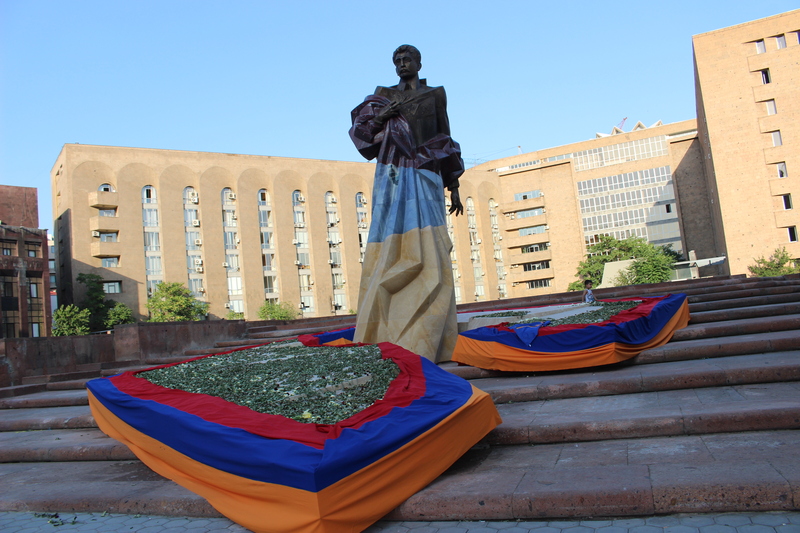 There is no completely independent power in the state, it depends on the people and meets its aspirations. The monument to Nzhdeh was established by the previous authorities. 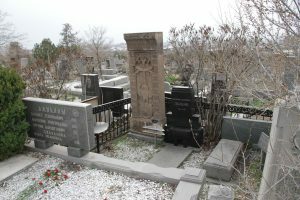 The decision for the installation of the monument to Aram was also made by the former authorities. 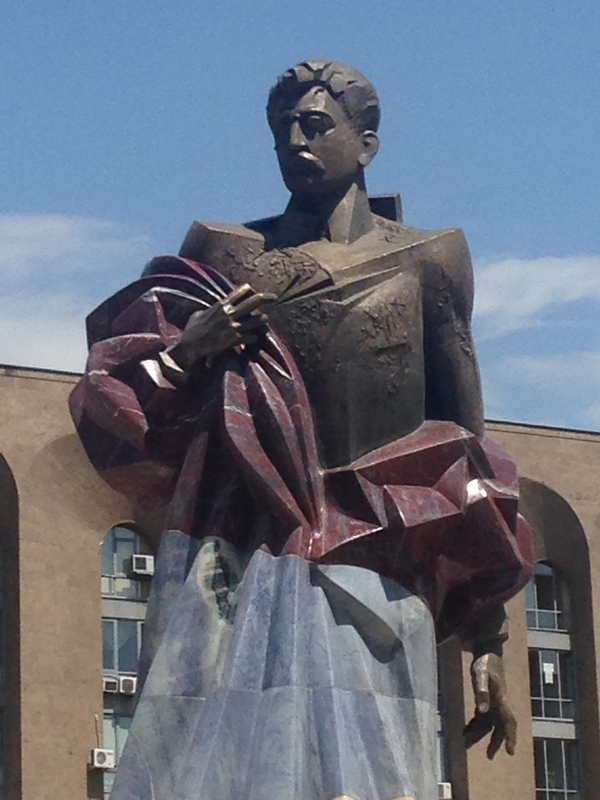 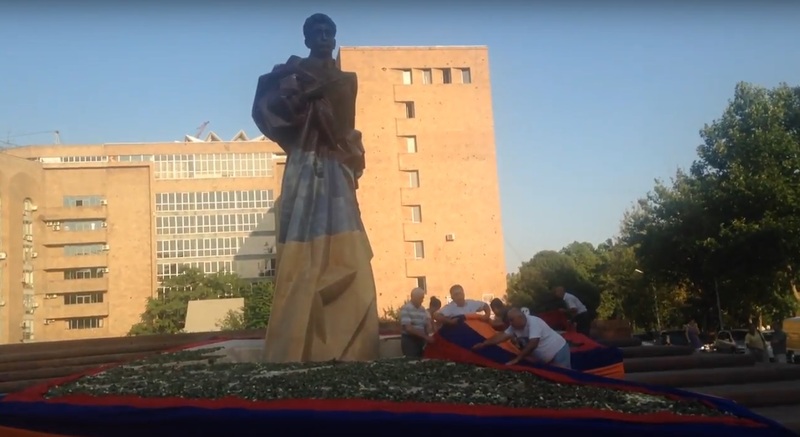 July 17 was the opening of the monument to Aram Manukyan — one of the founding fathers of the Armenian statehood, reborn after 543 years. 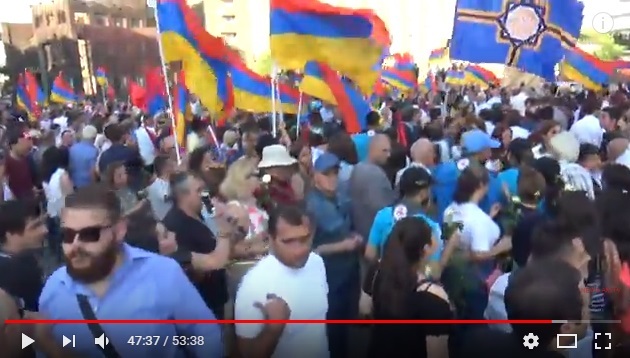 After the end of the event, almost all participants with hundreds of flags dispersed. 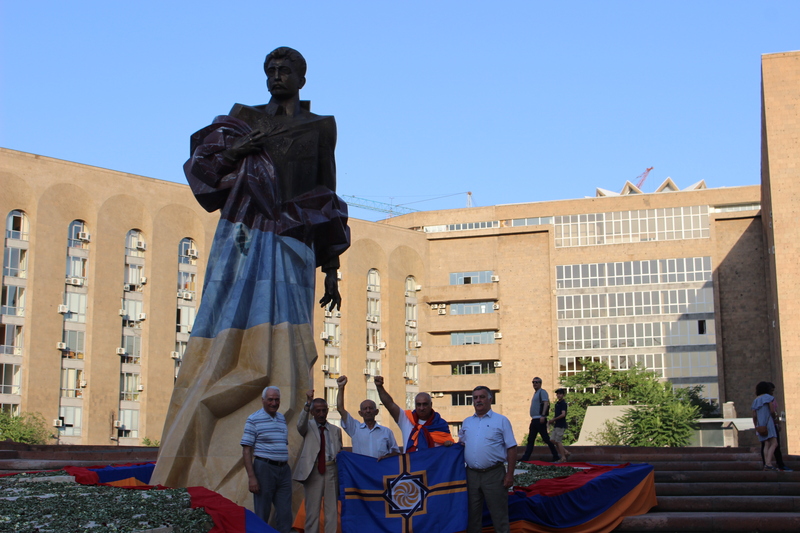 But near the monument were left until the late evening a few people with one flag of Western Armenia. 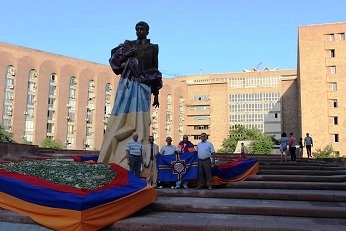 July 18 solemnity was continued with a small action. 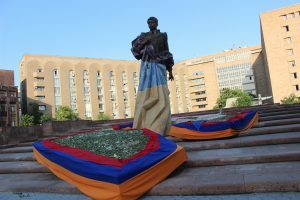 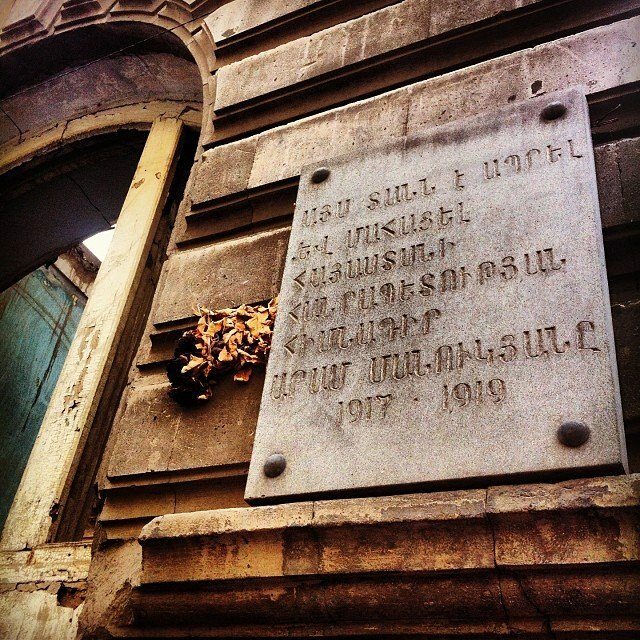 On photos and videos by Mushegh Gasparyan: preparation to the action. 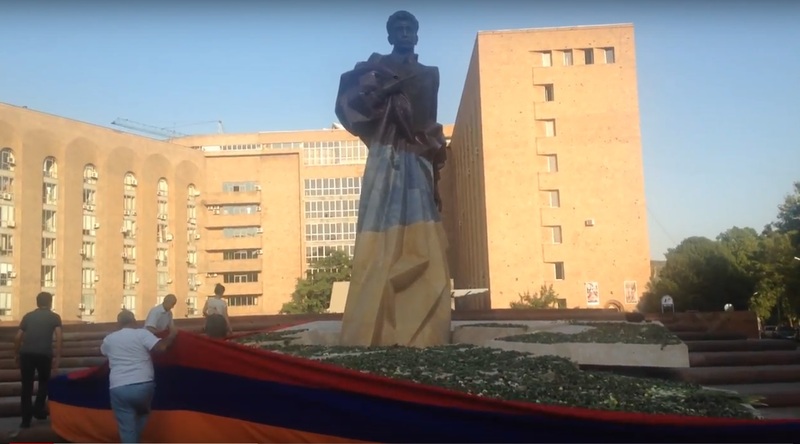 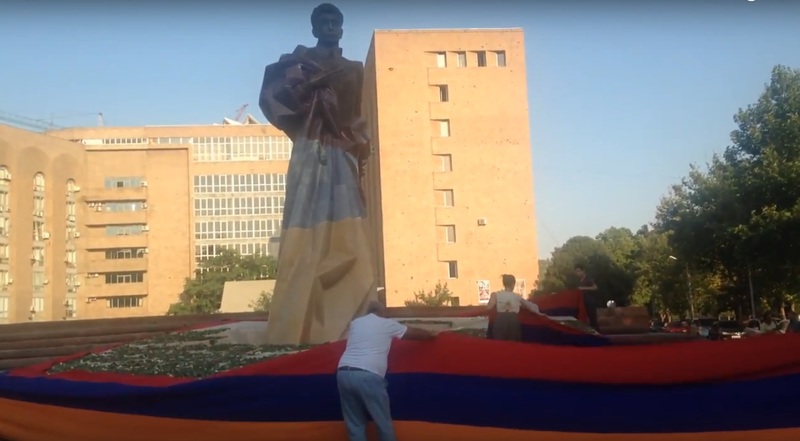 Five proud (as Pashinyan said) citizens of the Republic of Armenia brought the long (tens of meters) flag of Armenia and girded it, surrounded the monument to Aram. 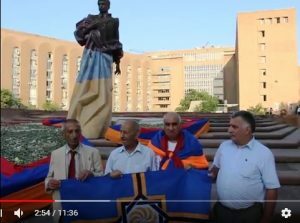 Each of them said a few words to publicly testify his position. 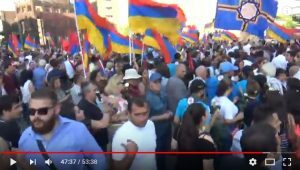 This short action was not from any party, not by the order of the authorities and not by a grant from foreign conductors like Soros. It was a small, but symbolic, voice of elderly Armenians with roots from Karin, Kars, Mush, Syunik and other places of Metz Hayk (Great Armenia). The multi-meter flag was made by Mushegh Gasparyan in the days of the April war (2016) and has already been a decoration of many patriotic public actions in Armenia. 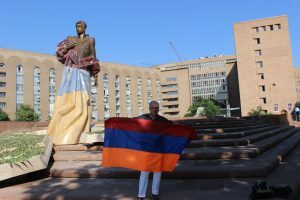 — an organizer of the first rallies in Sisian in 1988 of the Karabakh liberation movement, Artsakh war participant, writer, artist Vladimir Hakobyan. — an activist of the Armenian community of Saint Petersburg, the deputy of the parliament of Western Armenia Vahan Babakhanyan. The meaning of the action on July 18 was to repeat the words spoken at the opening of the monument: in each of us is and should be — Aram. 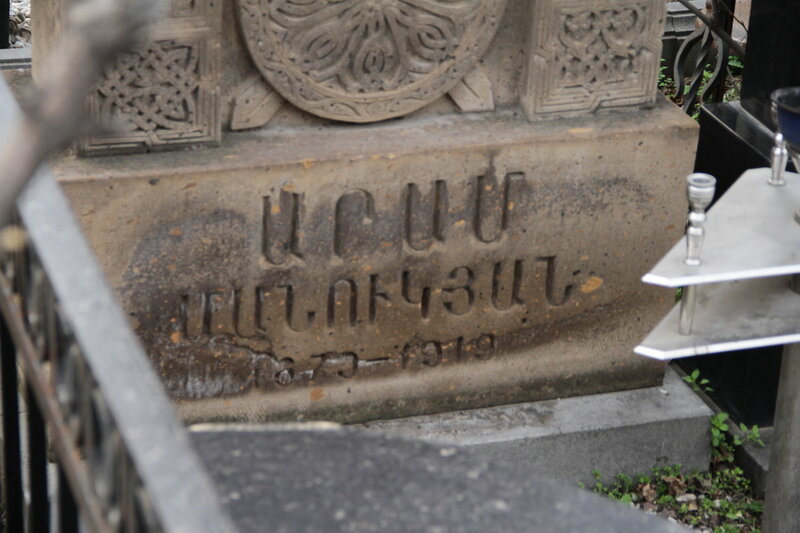 It is, indeed, a very significant figure in modern Armenian history, although, formally, he was one of the ministers in the First Republic for only 203 days, a little over half year until his untimely death from typhus (just 2 months before his 40th birthday). The meaning of the action is not only in paying honor to Aram Manukyan, but in realizing his mission, mission and practical missionary work of each of the us, Armenians right now, wherever we live on the planet Earth.